I took the opportunity to visit this small show in its second year. It is held in the city of San Rafael in Marin County about 45 minutes north of San Francisco. So even though it bears the name of the city and the bay it is actually held in Marin County which is also one of the counties on the bay. The venue is at the Embassy Suites Hotel and the dealers occupy about half the rooms on the second floor. An over view of the interior of the Suites from the 2nd floor. There were 32 dealers in 25 rooms who set up at this show so a few of them shared space. So there weren't too many rooms to visit and you could see everything there in a fairly short period of time. I had seen most of these folks at the various Tucson venues and at the West Coast show in May. Not much new to report on but there were many excellent specimens on hand. One of the first dealers I visited was Leonard Himes. Leonard and Cal Graeber have secured the entire production of diaspore from Turkey. These are considered some of the best of the species ever found. This is not a new locality but it is a tough one for new specimens. Leonard told me that only 50 or specimens were produced in the last two years! Leonard Himes had this fine 3.5 cm specimen of diaspore available along with about 35 others. A large 15 cm specimen of diaspore from Turkey. Arizona dealer Evan Jones had new specimens of Red Beryl from an adjacent property (called the Red Emerald Claim) to the Violet Claims in Beaver County, Utah. These are every bit as red as those from the claims made famous by Rex Harris over the years and it appears that production will be steady though nowhere near as prolific as the specimens from the Violet Claims. A large 4 cm specimen with several deep burgundy red crystals of red beryl to 1 cm. Reno, Nevada dealer Scott Werschky was set up with Mike Keim of Marin Minerals. Scott has been helping Polish dealer Tomasz Praskier, who's written a few articles for the Mineralogical Record recently, with various lots of minerals from Morocco and Russia. I saw these unusual specimens of orange vanadinite from Taouz, Er Rachidia Province, Meknes-Tafilalet, Morocco and bought them all. There was also a lot of the rare mineral lorenzenite from Flora Mt, Lovozero Massif, Kola Peninsula, Murmanskaja Oblast', Northern Region, Russia. I bought all of them as well. The speculation on the vanadinite specimens is that there was a phase change towards an increase in arsenic during mineralization to change the color from the typical red to this appealing orange color. 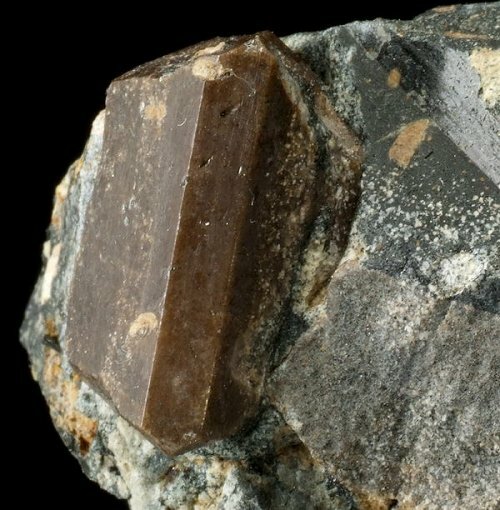 A 4.1 cm specimen with crystals of vanadinite to 1.4 cm. Here's a specimen with a 1.7 cm doubly terminated crystal of lorenzenite. Here's a 15 cm specimen of smoky scepter quartz. Ok. Not a lot to talk about in terms of new specimens but I did find a number of random things which will make for an interesting update I think. I think this show has a future though I think the location in San Rafael is probably not the best for this region. It is a good hour and change from the San Francisco (SFO) airport and a similar time from Oakland. From San Jose it is at least 1 hour 45 minutes by car. In my humble opinion the show would do better in a more centrally located place like the east bay near Berkeley/Oakland or on the peninsula near SFO. Most dealers said that traffic was better than last year though the last two days there were many more dealers than people it seemed. Anyway, it is a new show and will likely grow as time goes by.